A few good months ago, I entered a local cooking competition in South Wales - Newport's Best Dish based on the cookery show Britain's Best Dish. Newport (known in welsh as Casnewydd) Best Dish is in its second year. I am not one for competitions and especially not those where I am placed in the limelight. So my reasoning for entering was two-fold. One to experience what it was like to cook under pressure, and to a strict deadline; and two, to use the competition as means to promote the cafeteria when it officially opened early this month. But the fact is there has hardly been any promotion of the competition and its outcome by the organisers or the local council on its web pages of the winner or the runners up. To add to this very little if any interest has been shown by the local media of the competition. Never mind. Anyway, the dish I decided to enter was deliberately chosen to highlight my Welsh heritage and my return to home - Wales - my Caerphilly Cheese, Leek and Potato Pie. My dish came runner up, third in fact - not bad for a vegetarian dish I think. I also entered this pie into lovethegarden in March where the theme was to cook with leeks. The competition was judged by Kerstin Rodgers also known as Ms Marmite from The Secret Garden Club. I was fortunate to come runner up and win my very own copy of her cookbook: Supper Club - see here. 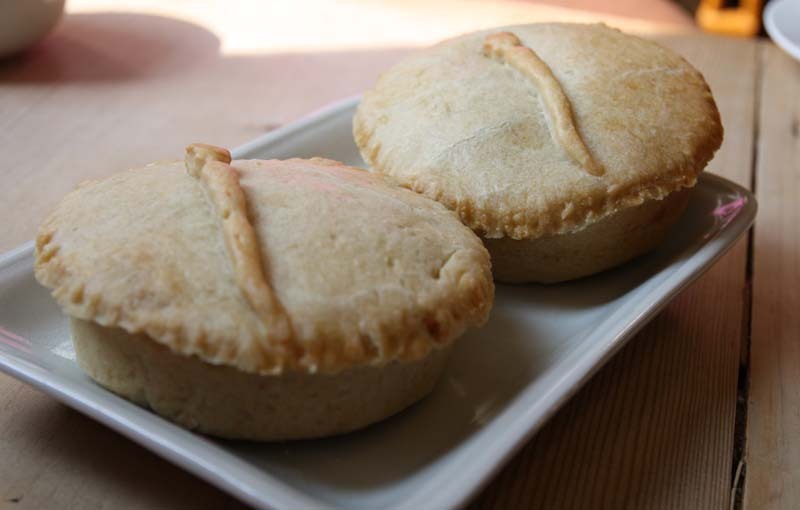 Since opening the cafe these individual pies have been made every week. They have been popular with customers - to eat in warm or take out. The recipe can be found here. I do sometimes glaze these Caerphilly Cheese, Leek and Potato Pie with egg wash.
Wow, there just doesn't seem to be enough hours in the day for me to sit down and blog anymore. I am missing not only blogging about what I have made in the kitchen, I am also really missing reading fellow bloggers blogs and what you have all been up too. When I get a whole day to myself, I intend to just sit in front of the computer and catch up - promise. Anyway, this evening I have managed to get away from the cafe a couple of hours earlier. So after, a little catch up on housework, I have sat down to share a recipe I made last week for the cafe. 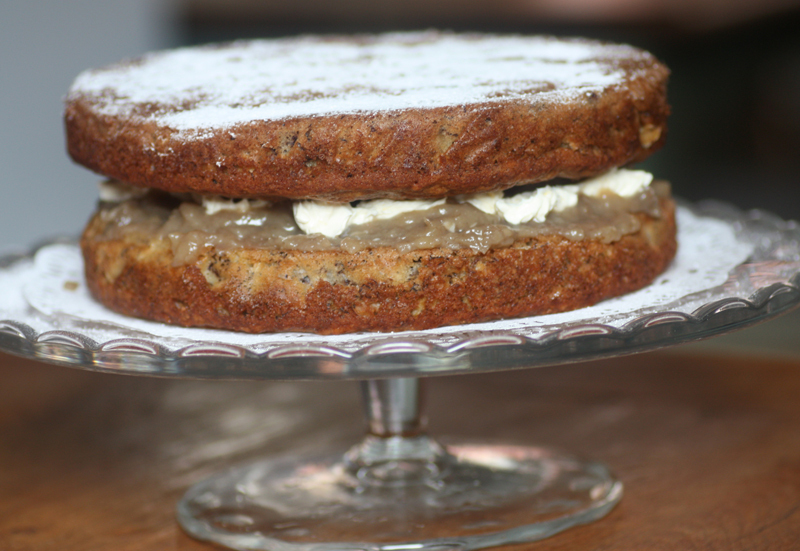 Its a rather decadent Banana Toffee Curd Cream Cake. This Banana Toffee Curd Cream Cake has appeared on my blog in a previous guise. 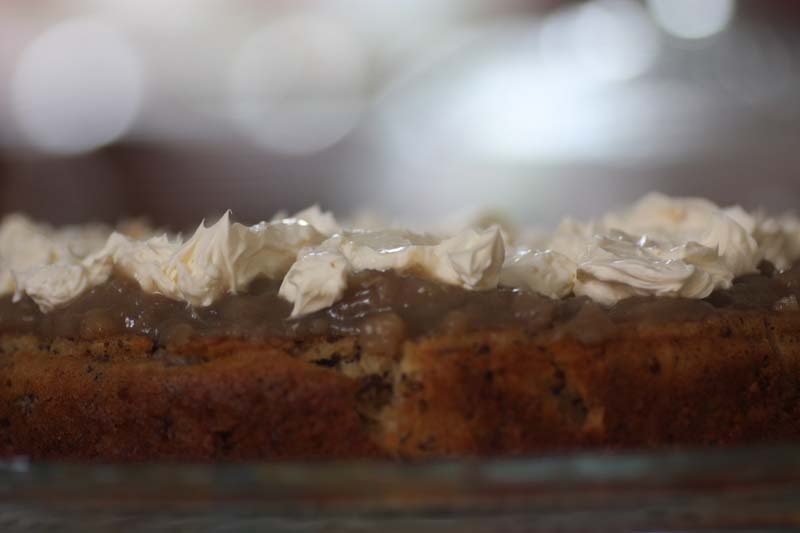 Its actually a simple Banana cake recipe that I make. Instead here, I have split the batter between two 8 inch round baking pans; and then slathered it generously with home-made Banana Curd, as well as some freshly whipped double cream. I've had a couple of people approach me and ask if I would make them a whole cake to take home. Now that is approval. 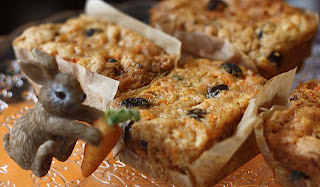 I am sharing this crowd pleaser with Karen at Lavender and Lovage and Kate of What Kate Baked for their Tea Time Treats. The theme for this month is Summer Fairs and Fetes; Cake Stall Cakes and Bakes - now that's a mouthful! Well let me first start by saying Thank you so much for all your warm and encouraging comments on my previous blog entry. Each one, honestly made me feel warm and fuzzy inside, so thank you truly. I have made a decision to close the doors to the cafe on Mondays. So today which would ordinarily be a big cook and preparation day for the beginning of the week has been a much appreciated day off. This morning I had a long lie in bed, a walk along the canal, house work! and right now catching up on a little blogging. 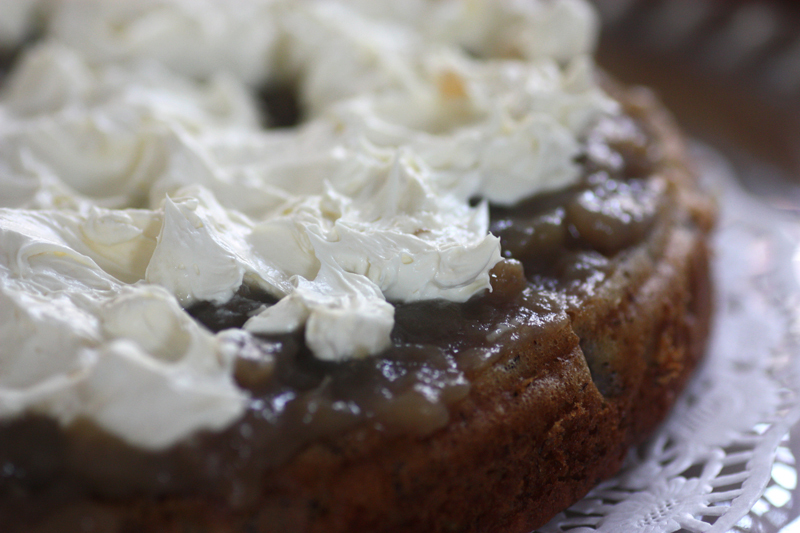 I also have a new recipe to share with my fellow readers: a vegan carrot cake. 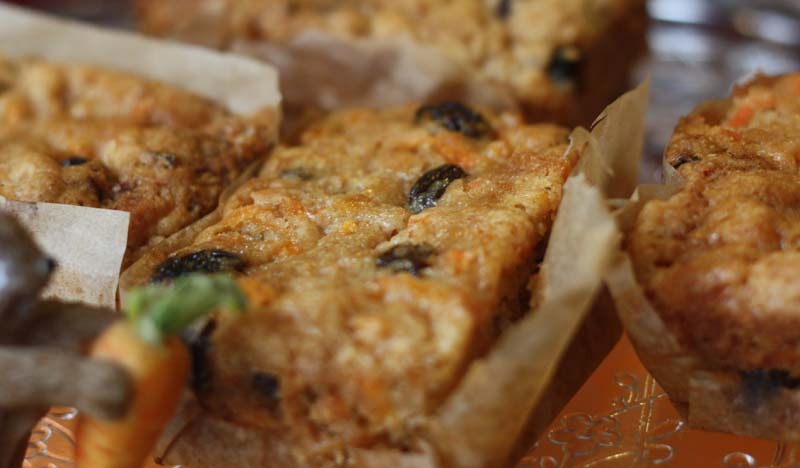 I have a number of carrot cake recipes on my blog: including those made with Rainbow Carrots; and a Carrot Orange Cake; but I have not got round to sharing the vegan version until now. As you can imagine, I have been cooking and baking non-stop since opening Hunky Dorys and one of the home bakes that has been proving very, very popular is the Vegan Carrot Cake - in fact I sold out of it last Saturday. This carrot cake is light, sweet and moist. You can keep it just pure carrot orange in both flavour and in colour, but I wanted to add some raisins to mine for additional burst of flavour and speckled effect . I used to make this vegan carrot cake in a 8 inch by 8 inch square baking tin , but now for the cafeteria make them in individual mini loaf pans. Preheat oven to 350 degrees and grease a 9x9 inch square pan with oil. Mix together the flour, sugars, salt, baking powder, baking soda and cinnamon until thoroughly combined. Add the shredded carrots and the oil to the dry ingredients and mix well with a spoon. Add the orange juice and mix again, then fold in the nuts, raisins and coconut. Put the batter into pan. Bake for 45 minutes or until knife/toothpick comes out clean when inserted in the centre.